Hell Nurse Katie is a magical nurse girl, given power by Heaven to grant peace and hope to those suffering through Hell on Earth. On the spiritual plane she takes many forms, but her main avatar is that of a cute cartoon "nurse" who can use her magical Love Syringe to "inject" a mixture of Love, Laughter, and Hope into the hopeless. *Note: Hell Nurse Katie is not a licensed and/or registered medical professional. Hell Nurse Katie needs your votes! Go to the AnimeFEST website and vote for Anime Hell! Help support Hell Nurse Katie and cover up your naked shame! 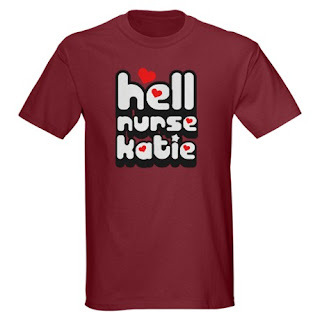 Buy the official Hell Nurse Katie Tee Shirt today!